Ian McCollum of Forgotten Weapons Blog always comes up with the most interesting old guns. In the video below, he discusses the Japanese Type 4 Garand. Partway through 1944, the Japanese Imperial Navy began a program to provide their infantry units with better firepower than was afforded by the bolt action Arisaka rifles. The initial experimentation was based on rechambering captured US M1 Garand rifles for the 7.7 Japanese cartridge, but an incompatibility of American en bloc clips with the Japanese cartridge hamstrung the project. In response, the M1 was reverse engineered, and the Yokosuka Naval Arsenal began to manufacture a copy of the rifle which would use a 10-round fixed magazine fed by two standard stripper clips. This rifle was designated the Type 4 (2604/1944), although it is often referred to today as the Type 5. In total, parts for 200 rifles were manufactured, but only about 125 had been actually assembled into functional guns by the time the war ended. I lived in Haywood County, North Carolina for 32 years and still have property there. Thus, when I got the alert below from Grass Roots North Carolina about the intended anti-gun actions of the Haywood County Board of Commissioners I began to get angry. Then I read the three proposed ordinances and became really angry. There are parts of the first two ordinances that are direct violation of state law regarding carry in state, county, and municipal parks and that is just the beginning. Moreover, the outdoor range ordinance requires more of private ranges than it does of the county's own sheriff's department. The proposed ordinance §161.07(B)(1) states, "All shooting stations and targets on a range shall be located a minimum of three hundred feet (300’) from any property line." The backstop of the range that they share with the Maggie Valley Police Department is a mere 90 feet from the nearest property line. §161.07(D) of the ordinance requires that " All shooting stations, targets, and firing lines" be more than 1/4 mile or 1,320 feet from any occupied building. There are two retail stores at about 1,100 feet from the backstop and a handful of residences that are within the 1/4 mile radius of the target range. You can see this in the screen cap from the Haywood County GIS map. 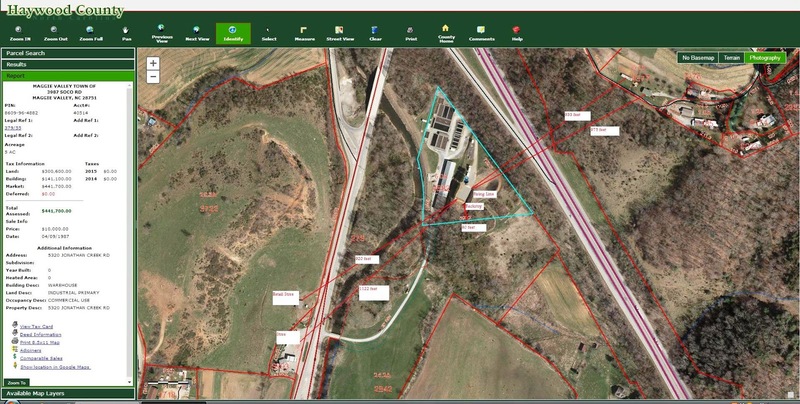 The HCSD/MVPD range is adjacent to the Town of Maggie Valley water and sewer plant. I have labeled the firing line, backstop, and distances to the property line and buildings. If you are a Haywood County resident, taxpayer, or just someone who visits the county, I would urge you to either attend the meeting on Monday or email the commissioners. I most certainly intend to do so. A special meeting will be held regarding a gun-ban ordinance this Monday, at 5:30 PM, in the Haywood County Courtroom of the Historic Courthouse (more meeting details below). Please join GRNC President F. Paul Valone at this meeting, where the Haywood County Commissioners will be discussing an ordinance to BAN ALL OPEN AND CONCEALED CARRY in and on any county owned or controlled property. This ordinance would reverse regulations dating back to 1995, which recognize the citizens' civil rights in this area. (Click here to read a copy of the proposed new ordinance). EMAIL THE HAYWOOD COUNTY COMMISSIONERS. Urge them to vote against the gun-ban ordinance. Below, find a copy/paste email list, and under 'Deliver This Message,' you'll find a copy/paste email message to send. HINTS: Dress for the press! Please no offensive signs, slogans or clothing. UPDATE: I received an email last night from Commissioner Kevin Ensley (R-Haywood) who said he would be voting in favor of concealed carry on county premises. Kudos to Mr. Ensley to listening to the people of Haywood County. I fear that some of the other commissioners are not so willing to listen to their constituents. Jerrika Insco of WLOS has a report on the Monday evening meeting here. I sense a lot of backpedaling on the part of the Haywood County Manager Ira Dove. He is trying to portray the moves by the county as being misunderstood by residents. He's trying to say it has always been banned and all the county is doing is updating their ordinances to comply with state law. That is only partially true. Including the county-owned Allen's Creek Park in the list of places that ALL carry is prohibited flies in the face of NCGS Sec. 14-415.23 which specifies where and where not carry can be prohibited in county, municipal, and state parks. If there is one thing that this political season has shown is that people are sick and tired of business as usual. How else do you explain the rise of a reality-TV star and billionaire businessman on the Republican side and an obscure, not even elected as a Democrat, self-avowed socialist on the Democratic side of the ticket. Both Trump and Sanders would be long gone in years gone by. In the midst of all of this comes a proposal from New Jersey State Senator Gerald Cardinale (R-Bergen, Passaic) that would allow legislators and municipal and superior court judges to obtain carry permits to protect themselves. Nevermind that it takes an Act of God and then some for ordinary New Jerseyans to get carry permits or even a pistol purchase permit. Witness the death of Carol Bowne who was still waiting for her permit when her stalker killed her. Senator Gerald Cardinale (R-Bergen, Passaic) introduced a bill that would allow legislators, as well as judges at the superior and municipal court levels, to obtain permits to carry handguns provided they complete at least eight hours of firearm safety training. The bill (S-1982) was inspired by attacks, such as the 2011 shooting of Arizona Congresswoman Gabby Giffords. Giffords was shot in an assassination attempt during a meeting with constituents at an Arizona supermarket. More recently, a Texas judge was wounded in a shooting outside of her home in Austin. Judges and legislators would be exempt from New Jersey's requirement to show "justifiable need". They would merely have to show that they took an 8-hour class. Alexander Roubian of the NJ Second Amendment Society is correct when he calls Cardinale's proposal completely hypocritical. Judges and politicians are generally well-guarded by security and they have easy access to police, Roubian noted. And, he argued, they’re already more likely than average citizens to pass the “justifiable need” test because they’re friends with the judges who issue the permits. “Basically, this is a clear-cut example of how New Jersey operates as a fiefdom. The politicians’ and the judges’ lives, they truly believe, are more valuable than those of average citizens like you and I,” Roubian said. I would add that Sen. Cardinale, in this of all years, just doesn't get it. Given that he has been in one house or the other of the New Jersey legislature since 1980, maybe it is time for the 82-year old dentist to go home. Matt at LFD Research has a series of "high energy" research projects up on YouTube. In the one below, he looks at the hydraulic energy transfer of different weights of .223/5.56 bullets. Frankly, I was a bit surprised by the destructive potential of 40 grain bullets. I can see why they are good for varmint hunting. It does make me wonder what a gelatin test would show insofar as penetration. Matt has been a guest on The Polite Society Podcast in the past to talk about his research. I think this type of home-grown amateur research is interesting because it is something that we can all do. New York City is not only one of the most anti-gun jurisdictions in the country but also one of the most anti-knife. Their prosecutions of honest citizens for "gravity" knives is over the top. There is a bill in the New York Senate that would correct many of these abuses by clearly defining both switchblades and gravity knives. A correct definition would eliminate prosecutions for having your average lock-blade knife. Knife Rights is urging that anyone who lives, works, or merely visits New York to contact Sen. John Flanagan who chairs the Senate Rules Committee and ask him to schedule a vote on S6483A. The next hurdle to getting Knife Rights' New York Knife Law Reform bill (S6483A) passed to end the widespread persecution of those carrying pocket knives in New York City is to get the Senate Rules Committee to pass the bill so it can be voted on by the full Senate. If you live, work or travel in New York and New York City, please CALL or EMAIL the Chairman of the Rules Committee, Senate Majority Leader John Flanagan, TODAY and simply deliver the message that you are "calling/writing to respectfully request that Leader Flanagan please schedule S6483A for a vote" and then thank him. Please be POLITE and RESPECTFUL. Again, please be POLITE and RESPECTFUL, just deliver the message: "I am calling/writing to respectfully request that Leader Flanagan please schedule S6483A for a vote," and then thank him. That's it, keep it short and simple and above all BE POLITE and RESPECTFUL. If you call, they may ask you the city and state where you live, for their call record. If you email, include your city and state. In either case, if you live out-of-state, explain how you work in, or travel to, New York / New York City. S6483A adds clarifying bias-towards closure exclusions to the state switchblade and gravity knife definitions, similar to that included in the revision to the Federal Switchblade Act that Knife Rights helped pass in 2009. This clarifying exclusion should prevent the bogus Gravity Knife arrests and prosecutions of honest law-abiding individuals in New York City who are carrying common folding knives, tools that are legal to carry everywhere else in t he U.S. Neither Gravity Knives nor Switchblades have a bias towards closure found in common folding knives to keep the blade safely closed in the pocket. Only in New York City has the NYPD and District Attorney Cyrus Vance, Jr. abused the state's gravity knife law to prosecute those carrying simple pocket knives by claiming they are illegal Gravity Knives. Hundreds of innocent pocket knife carriers are being arrested every week! Meanwhile, our Federal Civil Rights lawsuit against New York City and District Attorney Cyrus Vance, Jr. over these unconstitutional arrests and prosecutions continues with a trial date now scheduled for June 16, which will be just over five years since the lawsuit was filed. The quicker solution is to get S6483A passed. Hillary Clinton and the gun prohibitionists are on a jihad against the Protection of Legal Commerce in Arms Act. They have been willfully mischaracterizing it as a total exemption from liability by the firearms industry. In fact, it only protects the makers and sellers from the misuse of their products by criminals and contains six enumerated exceptions to the qualified civil liability protections in the law. The NSSF has released a YouTube correcting Hillary. It is worth two minutes of your time. Since we are talking about things Irish today, I thought this interview with a curator of the National Museum of Ireland was appropriate. In it, Lar Joye, the curator of Irish military history at the National Museum of Ireland, talks about the Mauser (Howth) and Lee Enfield rifles and other weapons used by the volunteers and the British during the 1916 Rising. The centennial of the Irish Rising will take place on April 24th. You can see the video of the interview here. The Howth Mauser is also known as the Mauser Model 1871 or Infanterie-Gewehr 71. It was a single shot 11mm black powder rifle. Or, Happy St. Patrick's Day. The Irish Times has published a list of 14 sayings in Irish that most of us will have no clue on how to pronounce. I include myself even though I did take a class in Irish at UNC many, many years ago. The following is a list of handy seanfhocail you might use, with suggestions for when you might use them. Chances are those around you will not understand what you are saying. And as the old saying goes: Beatha teanga í a labhairt (the life of a language is to speak it). Is lia gach othar i ndiaidh a leighis (every patient is a surgeon after he is cured). Listening to a punter on the tube talking loudly about his morning after cure. Ar mhaithe leis féin a bhíonn an cat ag crónán (the car purrs only for its own benefit). On hearing a colleague talking loudly about his latest success. Déan mórán agus can beagán (do a lot and say little). Advice for the above. Ní dhíolann dearmad fiacha (just because you’ve forgotten a debt, it doesn’t mean you no longer owe it). When someone “forgets” it is their turn to buy the next round. Siúlach scéalach (chatty traveller). When someone next to you volunteers story after story after story. Sceitheann fíon fírinne (in vino veritas). To be used at the staff Christmas party. Tógfaidh dath dubh ach ní thógfaidh dubh dath (a garment can be dyed black but a black cloth cannot be dyed any other colour). It is easier to defame someone than to restore their reputation. To be used the day after the Christmas party (see above). Bíonn caora dhubh ar an tréad is gile (even the brightest flock has a black sheep). There is always one! To be used at kids birthday parties. Cuir síoda ar ghabhar is gabhar fós é (put silk on a goat, it will still be a goat). Friday night fashion. Tarraingíonn scéal scéal eile (one story always leads to another). A good motto for journalists. Is minic bréag ar aonach (there are many lies at the fair). To be used in the presence of salesmen everywhere. Má chailleann tú uair ar maidin beidh tú á tóraíocht i rith an lae (if you lose an hour in the morning you’ll be looking for it all day). Obey the alarm clock! Is ait an mac an saol (life is strange). When you hear Irish being spoken in a far-flung land. Is binn béal ina thost (silence is golden). What you say to someone when you realise they are speaking ill of you in Irish. The Second Amendment Foundation has a vested interest like we all do in making sure that Justice Scalia's replacement doesn't undue his work. To that end, they immediately came out against President Obama's nomination to fill the seat, Judge Merrick Garland. Garland Nomination Should Be Rejected! BELLEVUE, WA – The founder of the Second Amendment Foundation today said that the nomination of Judge Merrick Garland to the U.S. Supreme Court by President Barack Obama should be rejected. President Obama nominated Garland, who is the chief judge for the U.S. Court of Appeals for the District of Columbia, to fill the seat left vacant by the untimely death of Justice Antonin Scalia, author of the landmark 2008 Second Amendment ruling in District of Columbia v. Heller. Scalia was considered a giant on the court and one of its finest conservative voices. “Just as Second Amendment advocates have feared, President Obama is trying to change the court’s makeup to destroy the individual right to keep and bear arms,” Gottlieb stated. “This administration has done everything it can to erode the Second Amendment, and turn a right into a government-regulated privilege. Direct numbers for your Senators can be found here. It is time to start calling if you want to preserve your gun rights. The German sporting arms maker Blaser sent out a release today regarding their new over-under shotgun called the F-16. It is a very nicely made shotgun with nice lines and beautiful wood. With prices ranging from $3,795 to $4,195, the shotgun isn't cheap. However, what grabbed my attention is the Vimeo video that accompanied the release. If you like slow motion videography, it has some of the most beautiful scenes imaginable. You see not only the clay breaking but the pellets AND the wad hitting it. Watch the video below and see if you don't agree. The ALL NEW Blaser F16 from Blaser USA on Vimeo. Project Gunwalker aka Operation Fast and Furious is the gift that keeps on giving. If the Department of Justice and the BATFE wanted guns that had been walked to keep showing up at crime scenes in Mexico, they got their wish. The Associated Press reported this morning that a .50 BMG rifle found at Mexican drug lord Joaquin "El Chapo" Guzman's hideout in January was one of the ones sold through a straw purchase in Operation Fast and Furious. Officials say the weapon was one of 19 firearms that Mexican authorities said was recovered from the hideout and was the only one determined to be associated with the botched sting operation (sic), in which the Bureau of Alcohol, Tobacco, Firearms and Explosives allowed gun-runners to buy weapons in hopes of tracking them and disrupting gun smuggling rungs (sic). This information was revealed in a letter from Assistant AG for Legislative Affairs Peter Kadzik to Senate Judiciary Chairman Chuck Grassley (R-IA) and House Oversight and Governmental Affairs Chairman Jason Chaffetz. This letter gave an accounting of walked firearms that had been recovered in the US and Mexico. The same letter confirmed prior reports that one of 19 weapons — a .50-caliber rifle — recovered in the January raid in Mexico that resulted in the re-capture of drug lord Joaquin "El Chapo" Guzman also was traced to the ATF operation. The letter goes on to say that the Department of Justice "deeply regrets" that firearms connected to Project Gunwalker were used in violent crimes. If they really regretted it, former Attorney General Eric Holder would have been tried for his contempt of Congress citation and BATFE officials would have been fired and not merely moved around. As it is, Holder never was prosecuted and former Phoenix FD SAC William Newell, ASAC George Gillett, and Deputy Assistant Director Bill McMahon were never fired. The only people who suffered as a result of Project Gunwalker were Brian Terry, Jaime Zapata, 300 plus Mexicans, and their families who had to bury their loved ones. You could also add in the whistleblowers like Sr Agent John Dodson who had his life made a living hell by the powers that be. It's that time of year again. All Life Members (and higher) plus 5-year members of the National Rifle Association should have gotten their ballots for the 2016 Board of Director elections. Mine came with my March 2016 edition. It is my understanding that there are somewhere north of 500,000 members eligible to vote. If this board election is like those in the past, about 75,000 or less than 20% of those eligible will bother to vote. This is a shame. If you've gone to expense to become a Life Member or continually renewed your membership for the last five years or more, you ought to take advantage of that and vote! This year there are 39 candidates running for 25 spots. The Nominating Committee nominated 31 candidates while the remaining eight are on the ballot by petition. In addition, there is a recall election to remove Grover Norquist from the Board of Directors. The slate includes both what I call the show horses such as ex-NBA star Karl Malone, rock star Ted Nugent, and actress Susan Howard and the work horses like Sean Maloney, Tom King of NYSRPA, Sandy Froman, and a number of others. I guess both are needed. However, a board composed of 75 members is unwieldy and much of the work is actually done in committees. Committee work is the province of the work horses and they should be give more consideration. Jim Porter: lawyer, past president, chairs Legal Affairs Committee, sits on four other committees. Carol Bambery, pro-gun attorney, chairs Bylaws Committee and the National Firearms Law Seminar, vice-chair of two committees, member of two more. Sandy Froman, pro-gun attorney, past President, sits on three committees. Tom King, State activist, chairs Small-Bore Rifle, sits on four more committees. Lance Olson, State activist, chairs Gun Collectors, sits on three more. Bob Sanders, pro-gun attorney, sits on Legal Affairs and on the Civil Rights Defense Fund. Steve Shreiner, busy Colorado activist, sits on GrassRoots, holds Bronze Star with V for valor and Silver Star, both from Vietnam. I'm probably biased -- four out of seven are pro-gun attorneys, and I have more opportunity to see them in action. On the other hand, I know they all show up for each meeting unless there is a compelling reason otherwise. Dave also recommends a "No" vote on the recall of Grover Norquist. Next up is Sebastian of Shall Not Be Questioned. In the past, he notes, he has endorsed Tom King, Carol Bambery, Sandy Froman, and Graham Hill. He says, "I would not change my vote." He also will NOT be voting for Ted Nugent though he presumes Uncle Ted will do just fine without his vote. With regard to the Norquist recall, he is a solid "No" on the recall. Sebastian points out that the person who started the drive didn't even bother showing up to the hearing on the recall. Moreover, some who are advocating Norquist's recall are doing it due to his position on immigration. As Sebastian notes, he is steadfast against the NRA taking any position on immigration. Lt. Col. Robert K. Brown, a NRA board member and publisher of Soldier of Fortune magazine, always comes out with a list of candidates he endorses. His list from Facebook (with spelling corrections) is below. Note he does say to vote "Yes" on the recall of Grover Norquist. I am voting for the recall of Grover Norquist. The list published in the magazine omits Robert Thornton. The NYSRPA strongly suggests that you follow the advice of the NRA Nominating Committee when casting your ballots in the 2016 NRA Board of Directors Election. All the people on this list are good hard working dedicated advocates for the 2nd Amendment. Many an energetic person is compared to the Energizer bunny. A better comparison for Sean is a nuclear submarine. He seemingly can run continuously for 30 years without refueling, stopping briefly every 6 months to take on food and nourishment. He spends most of his time quietly helping ensure our rights are safe, but has the ability to deliver extremely effective influence anytime and anywhere it is needed. Gun owners need a strong NRA, and the NRA needs Sean Maloney. You can vote for up to 25 people, but you don’t need to vote for that many. If you only vote for one person, vote for Sean. He’s great for the NRA, great for the cause, and is a great person. With a presidential race and impending Supreme Court Justice nominations, gun owners will cast many important votes this year. Don’t overlook the importance of the NRA BOD. The last endorsement - and one of the most important in my opinion - comes from Jeff Knox of The Firearms Coalition. Jeff, son of the late Neal Knox, is one of the more thoughtful leaders of the gun rights movement. He brings to the table a sense of history as well as his family's long legacy of fighting for the Second Amendment. He, too, is endorsing Sean Maloney. While I am only printing an excerpt of his endorsement, I believe you should read the whole thing including his analysis of the race, his rationale for a single endorsement and his reasoning for voting "No" on the recall of Grover Norquist. The one incumbent I strongly support, and who I see as most vulnerable, is Sean Maloney. I endorsed Maloney and his fellow Colorado Recall architect Timothy Knight last year. Knight made the cut, but Maloney did not. Thankfully, he was able to win election to the one-year, “76th Director” seat that is voted on each year at the NRA’s Annual Meeting of members. During his year on the board, he obviously impressed folks because he has gotten the nod from the Nominating Committee this year, as well as being nominated by petition. That’s pretty unusual but doesn’t surprise me. Maloney is an impressive guy and a workhorse for the cause. He’s an Ohio attorney, where he is very active in local battles, but he virtually moved to Colorado to assist with the recall effort. And that’s not the first, or last, time he’s simply shown up on the front lines with his work gloves on asking how he can help. He’s a firebrand and he’s smart. We need people like Maloney on the NRA Board. I am going to vote only for Maloney, because if I cast a vote for any one of the other 19 candidates actually competing for the last few seats, that person – who I like but don’t support as strongly as I support Maloney – could bump Maloney out of the running, meaning I would be negating my own vote. Therefore, I am asking NRA voting members to join me in casting a single “Bullet Vote” for Sean Maloney. To reiterate, you must be either a Life Member or an Annual Member with five years of consecutive, unbroken membership to vote in this election. If you meet that criteria and haven't received a ballot, I suggest you contact the NRA. Finally, your ballot must be received by the accounting firm of Deloitte and Touche by May 1st. This is a strange election year. A lot is at stake for the Second Amendment and our gun rights. We need a solid NRA Board of Directors if we are to withstand the well-funded forces against us. So, if you are eligible to vote, then do it. Don't sit on your hands and let others make the decision for you. Take charge and make it yourself. I came across to a link to this video earlier today. In it, Chris Baker of LuckyGunner.com goes through four drills that he suggests you should practice if you intend to use a shotgun for home defense. As I bought the Complementary Spouse a 20 gauge Mossberg 500 Bantam Tactical shotgun (with a purple stock and handguard!) for Christmas, I think these drills have a lot of merit. Chris explains it in detail here. I met Chris at the NRA Annual Meeting last year in Nashville. He impressed me as an on the ball sort of guy. As a reminder, I am a LuckyGunner affiliate. Commissions earned through this program are donated in their entirety to gun rights organizations. Just use the LuckyGunner link in the upper right side of this page. They are one of the few places that has the 20 gauge Rio Royal Buck in #1 buckshot as well as the 20 gauge Brenneke Tactical Home Defense Slugs. Finding adequate home defense ammo in 20 gauge is a lot harder than finding equivalent ammo for the 12 gauge. Back in late December, Mark Malkowski and Stag Arms LLC ran afoul of the Bureau of Alcohol, Tobacco, Firearms, and Explosives. Stag Arms pled guilty to one felony charge of possession of unregistered machine guns and Malkowski pled guilty to a misdemeanor charge of failing to maintain proper records. The plea agreement required Malkowski to sell the company and is banned from owning or managing a firearms company. Fast forward to February 29th. White Wolf Capital of Miami, Florida announced that it had acquired Stag Arms LLC from Mr. Malkowski. He will be retained as a consultant by White Wolf. They said that they intended to keep the company operating out of its existing facility in New Britain, Connecticut. Malkowski said the purchase was aligned with his concern for his employees. Formal sentencing is scheduled for March 29. Considering the criminal charges, the sale and Malkowski's earlier thoughts about moving the company, the outcome is better for New Britain and Central Connecticut than many people might have expected. In the end, it was the employees who kept the company local, Malkowski said. "We had a lot of offers and we had a lot of people who had a lot of opinions but this one group was the one that aligned with the direction I was going," he said. "You spend sometimes more time with your employees than you do with your family...if not for that I wouldn't be here today." So a private equity firm buys a gun company. Big deal. We've seen that before. However, to me what makes this interesting are the other companies in White Wolf's portfolio. In addition to Stag Arms, White Wolf owns Ballistic Advantage, Aero Precision USA, and VG6 Precision. Tacoma, Washington-based Aero Precision is a major higher-end maker of AR components for the OEM market. In recent years, they have moved into making full firearms as well as uppers, lowers, and rails under their own label. Ballistic Advantage is barrel maker specializing in better quality AR barrels and components. They have partnered with Aero Precision on barrels. Finally, VG6 Precision, which was purchased by Aero Precision last fall, makes muzzle devices for both the AK and AR. It looks to me like White Wolf is looking to build synergies in the good-to-better quality AR market. It will be interesting to see how they use the OEM capabilities of Aero Precision to work with Stag Arms. For all I know, Stag could have been a customer of Aero Precision for years. Unlike a lot of buyouts, this one makes sense to me. I wish them luck in a competitive market. The quote of the day comes from conservative commentator and attorney Kurt Schlichter. His column at TownHall.com discusses the chaos of this election. Here he helps put things into perspective along with a warning to conservative candidates. Let’s be clear, conservatives: During this race, Trump fans are our opponents. But always and forever, the leftist scumbags of Occupy, BLM, MoveOn and their leaders like Bill Ayers, are our enemies, and if it’s a choice between the two I’ll side with the team that at least doesn’t hate America every single time. No equivocation. No hesitation. No regrets. This nonsense in Chicago was a preview; to the extent Rubio and Cruz hinted that somehow Trump himself was even partially responsible for an organized mass of leftist thugs shutting down his speech they were at a minimum wrong and possibly strategically confused in thinking they can ride the progressive tiger for a bit until it eats Trump. If the left wants to make it a rumble, then we need to say “Let’s go,” not “Use your words.” Never take sides against the Family with the anti-American left, Fredo. Never. I wonder if we have just witnessed a turning point in the presidential election. The turning point I refer to is Donald Trump's cancelled rally in Chicago, the attendant organized street violence by leftist groups, and the mealy-mouthed reactions by Republicans Kasich, Rubio, and, most disappointingly, Cruz. The mainstream media, Hillary, and Bernie reacted as expected. I should stop here and say that I've already voted for Ted Cruz in the North Carolina Republican primary and would do it again. I don't like the stuff The Donald says but I'll defend his right to say it no matter how absurd or offensive I find it. Nonetheless, listening to people at a local gun show plus the comments of people that I respect within the gun culture are leading me to believe the events may have just pushed Trump over the top towards the Republican nomination. This is just a feeling, a gut reaction, that these events will drive much more support towards Trump than it drives away. Call it the reaction of the Silent Majority to use a term from political yesteryear. I think there is a significant proportion of voters who are sick and tired of seeing the suppression of the free speech rights of conservatives being condoned even by other erstwhile conservatives. By contrast, every assorted leftist group imaginable can indulge in the most inflammatory speech and behavior with the tacit acceptance and perhaps even approval of the mainstream media. Moreover, they demand the right to suppress free speech when either the message or the messenger does not meet with their approval. These are just some musings on a Sunday evening as I've been thinking about it most of the weekend. Time will tell if it is just a point in time or a turning point. Aaron at the Weapon-Blog has released his monthly list of contests where you can enter to win firearms, hunting trips, accessories, etc. The link is here. To make it a little easier, he has provided me with a spreadsheet show all the contests. I've made the links hot for your convenience.